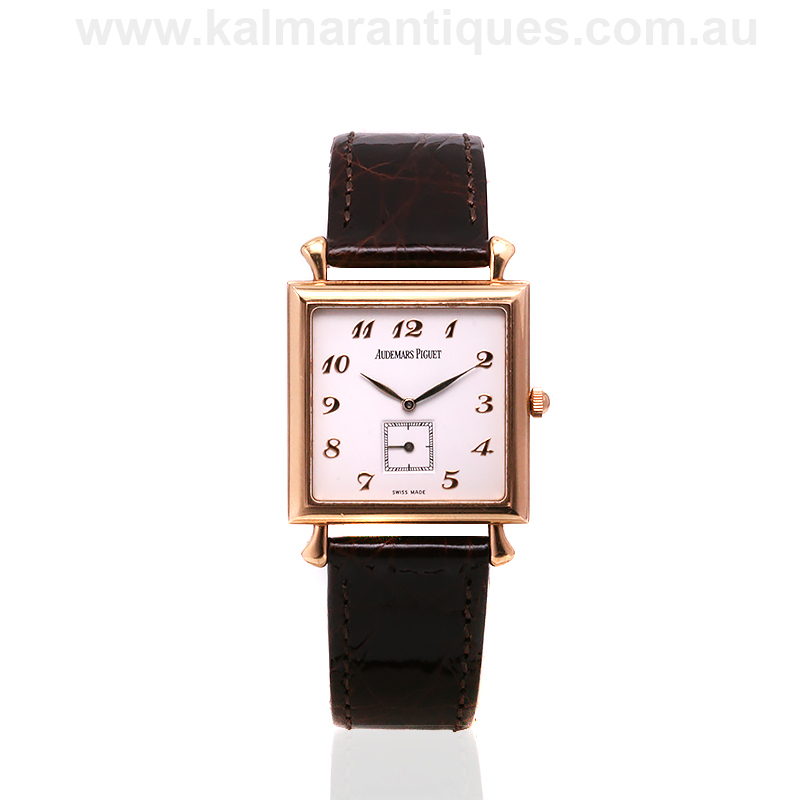 Product code: W1290 Categories: Sold Items, Sold Watches. Audemars Piguet are one of the finest watchmaking companies in the world, and here is a very stylish 18ct gold manual wind Audemars Piguet “Edward Piguet” wrist watch. Having made a name for themselves for not only producing very stylish watches, but also superb movements, Audemars Piguet are one of the few watchmaking companies in the world that are still family owned. This one is the Edward Piguet model, named in honour of Edward Auguste Piguet one of the founders of Audemars Piguet and is arguably one of the most stylish watches ever made. With those beautiful lugs at each end, and the pristine white dial with numerals, it also has the seconds counter at the bottom in a square border to compliment the shape of the case. Measuring 27.3mm across plus the crown by 36.8mm from lug to lug, this is a unisex sized watch that will always look so elegant day or night. Inside is the magnificent Audemars Piguet manual wind calibre 2085 that has just come back from a complete service and overhaul and comes with our twelve month warranty. So elegant and refined, this would have to be one of the most stylish Audemars Piqguet watches around, and one that will continually be admired. Tag: 18ct gold Audemars Piguet wrist watch. Since being founded in 1875 by Jules Louis Audemars and Edward Auguste Piguet in the famous Vallée de Joux region in Switzerland, Audemars Piguet have made a name for themselves as one of the finest watchmaking companies in the world. Making their first repeater in 1892, the company is well known for their highly sought after Royal Oak with its distinct and iconic case design. Another interesting fact about Audemars Piguet is that whereas many watch companies are owned by a handful of companies, Audemars Piguet to this day is still under family control.